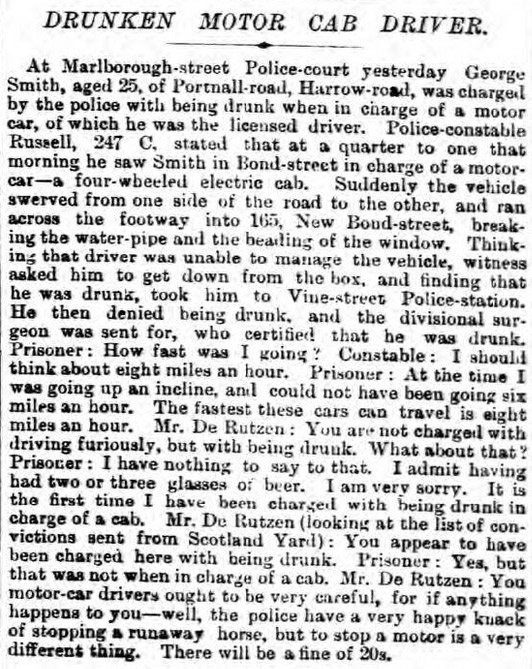 According to reports, on September 10, 1897, a drunken motor cab driver in London, England was arrested for drunk driving (DUI) after crashing his vehicle. The driver entered a guilty plea and was fined. Second, the “divisional surgeon” was called upon and was able to certify that the Defendant was drunk. Whether or not a driver is impaired is typically one of the main issues in dispute when challenging an allegation of driving under the influence or driving while intoxicated or operating a vehicle while intoxicated (DUI/DWI/OVI). There are a series of tests that are employed in the modern era, including the breath test, blood test, and a variety of field-sobriety tests. These tests, and their results, are subject to criticism by DUI Defense Attorneys with respect to their methodology, employment, and reliability. Next, it is interesting that a dispute is recorded as to the speed at which the vehicle was traveling. 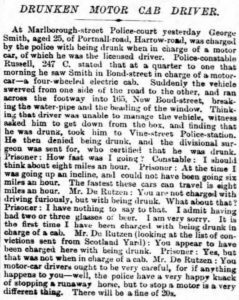 The driver claimed a speed of perhaps six (6) m.p.h. The constable alleged eight (8) m.p.h. It is interesting how these disputes seem to echo throughout the centuries. As long as there are vehicles and authorities, disputes regarding speed, speeding tickets and speeding allegations are here to stay. Although much has changed, so much has remained the same. If you or someone you know has a question regarding a traffic ticket in Tampa, Florida or needs to speak with a Hillsborough County DUI Lawyer, please contact Tampa Criminal Defense Attorney Ron Frey of The Frey Law Firm today.